I just received an e-mail from YoPlus with information about their new formula as well as a hot new printable coupon just for my readers!! According to the National Health and Nutrition Examination Survey, 80 percent of women do not get enough calcium to maintain strong bones. YoPlus is a good source of calcium and vitamin D to support bone health. YoPlus also contains live and active yogurt cultures L. bulgaricus and S. thermophilus, and delivers Yoplait’s signature great taste. “With its smooth creamy texture and unique flavor combinations, Yoplait YoPlus is an ideal option for someone looking for a snack that offers health benefits and is full of flavor,” said Betsy Storey, associate marketing manager for YoPlus. 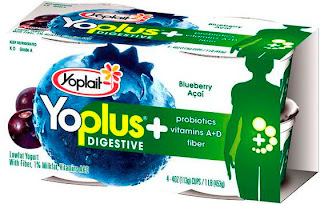 YoPlus Light is also available in supermarkets nationwide, and like YoPlus, it contains a special blend of probiotic cultures and a natural dietary fiber, as well as antioxidant vitamins and calcium and vitamin D, but with about 1/3 fewer calories than YoPlus. The light version, at 70 calories per serving, is available in three delicious flavors – Honey Vanilla, Strawberry Banana and Key Lime Pie. If you are interested in trying this new formula, you can get a coupon for $1.00/1 4-pack (IE or Firefox). I see these on sale many times for $2.00, so that would be $1.00 or $0.25 each! Thanks to YoPlus for sending this coupon and information to me to pass along to all of you! (KCPPM did not receive anything other than the same coupon for print as her readers. The information contained in this post was provided directly by YoPlus). « Tax Act: File Federal For Free!